We will not stoop to saying hateful things to each other. Don’t go there. 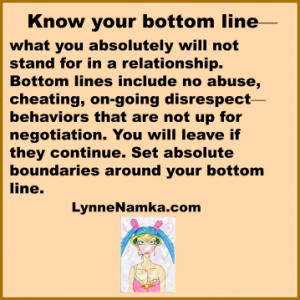 Not Sure if you have Healthy Boundaries? Asking for what you want and standing up for what you believe are some of the necessary skills for keeping your integrity. Satir told me, “Honey, you can always ask for what you want!” Not in my family, I couldn’t. I had to learn to speak up about my needs and also know that I wouldn’t always get what I wanted. Fair is fair! Getting past feeling uncomfortable about asking when you’ve been a submissive person all your life is part of growing up. If you allow the Bottom Line behavior to happen without your doing anything about it, your line slips lower and lower. Your partner will lose respect for you and continue to act out. And your self-respect will slip also. If you can’t set restrictions on inappropriate behavior of others (and many people cannot), get into counseling yourself to learn how to be more assertive. 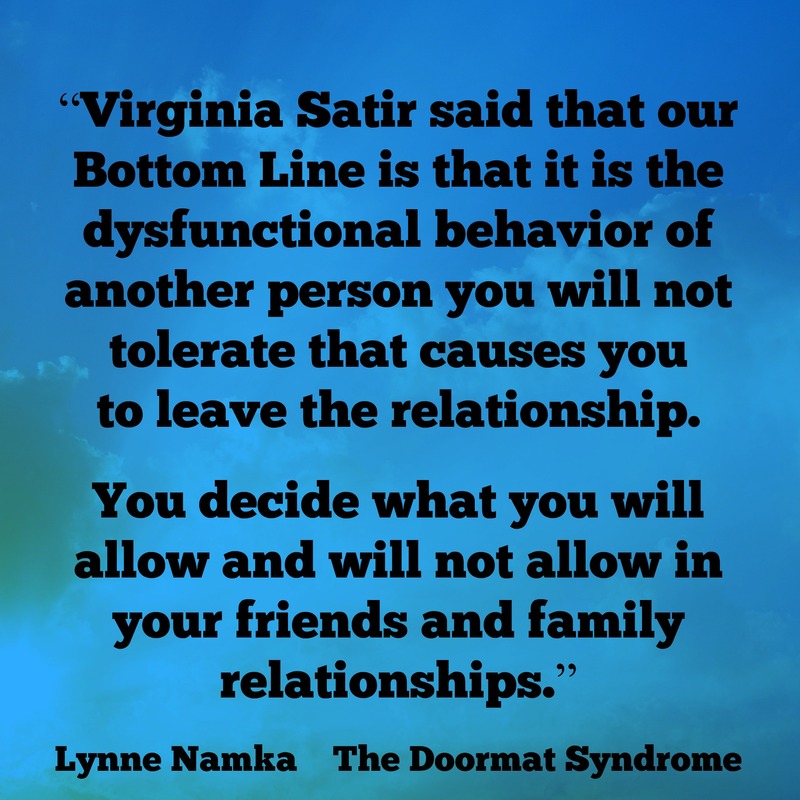 Boundary violations are rampant in people who live in relationships characterized by dominance and submission. You can change your role by examining the cognitive errors that keep you stuck and turn them around. Learning about healthy boundaries is one of the most important things you can do to create peace and happiness in your life. List the beliefs that keep you caught in an unhealthy situation at work or at home. Are you willing give yourself permission to state a boundary important to you and live with the consequences? Tap out old, unhealthy beliefs that keep you submissive. Go back through your answers and tap briskly across your body in a random pattern breathing deeply while you contemplate the errors in thinking that have kept you unhappy. Tap away while you forgive yourself for learning to give in to keep others happy. Take big breaths and blow out any sadness that comes up. If you address unhealthy beliefs that lie deep in your subconscious mind and live with your deepest values, you will never be as limited as you have in the past. 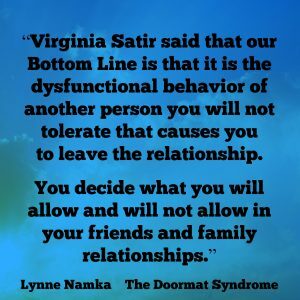 Setting and maintaining healthy boundaries are a necessary part of the growth process. Teach people how to treat you well and then treat them well in return. Good relationships have good boundaries!